"We'll be introducing a singer new to the Montreal scene. Her name is Elia Soul. She's a great singer with a repertoire that fits perfectly into our Chicago style. She'll sing jazz standards and blues. This is a show not to be missed." That was what I wrote. On that Friday, we did on of our best shows ever. Eilia did a great job and the crowd loved it. Two weeks ago, a guy from Chicago came in for the weekend and naturally he visited the House of Jazz. He frequents Chicago's famous Green Mill Jazz Club (so did Al Capone). He saw our band and joked, "I come from Chicago to Montreal, go to a club and what do I see, another Chicago band." When we say the "Real Deal" we mean it! Jazz influenced Chicago blues is not the most well known of Chicago styles of music but it's great fun to play and hear. We're the only group in Montreal that presents this style and we've become very good at it. We keep adding new material and refining our show. Last week we added a swingin' version of "What Is This Thing Called Love" and a very bluesy version of "Stormy Weather". That's why we call it the "real deal". Our sound reflects the energy and intensity Chicago musicians are famous for. Our Monday night shows reflect Chicago's famous Blue Monday sessions. Clubs that featured this music dotted the south side of Chicago. Among them were the "Tropical Hut", and the "Burning Spear" & currently, the Green Mill Lounge. Come down and join us. 7:30 to 11PM. Here's the link for Deep Blues " Work Song". Here's the link to my recent radio interview on CKUT radio. There's a few cuts from the Chi-Town Hustlers and I tell some stories about the legendary blues artists I had the great pleasure to both work with and know such as James Cotton, Otis Rush and Junior Wells. I'm looking forward to another interview. After the Easter holiday we were back on Apr. 8. Sylvia Harris came down as well as our friend Pat Loiselle. us next and did three smokin' tunes and the set ended with "Sweet Home Chicago". That was the pattern for the evening. sessions. You can come down every Monday and never see the same show. So come on down. 7:30-11PM. Deep Blue did the Blue Monday Session at the House of Jazz on March 18. This was the first Monday that we created that real Chicago Blue Monday feeling. cheering on the band. Among the tunes were Sonny Rollin's "St. Thomas". The night really got rolling with the second show. We were joined by our first guest, our buddy, ace harmonica and guitar player, Pat Loiselle. Pat sang a few tunes and played some great harp. Next the lovely Marjolaine joind us on stage and sang "At Last". The set finished with "Sweet Home Chicago" with Pat joining on harp. great version of "Summertime" We got back in the blues direction with "Work Song". The last section of the set featured our special guest, Sylvia Harris, she started with "Hoochie Coochie Gal" and off we went. Pat Loiselle climbed back on stage with some killer harp work and a few more blues tunes. the night finished strong with the whole gang on stage. This Monday night was a great example of the Blue Monday spirit. Everybody a had great time, new connections and friendships were made, and everybody went home with a smile on their faces. Deep Blue did Monday Mar. 11. Two great figures in Montreal nightlife were there. Georges Durst, the owner of the House of Jazz and the great Doudou Boisel. As I've mentioned before Doudou owned the Rising Sun and founded the Montreal Jazz Festival. Every jazz and blues great played at the Rising Sun. Doudou and I have a mutual admiration society. Doudou heard everybody play so when he's happy you know you're doin' pretty well. He also loves Peter Mika's very fine piano playing. During the last set we tried out two New Orleans tunes for the first time. They'll be in the repertoire from now on. as playing in Chicago this week. few clubs back then and he was part of the gang at the old Kingston Mines on Lincoln. James Cotton is one of the greatest harmonica players of all time and it was a real privilege to have played in his band. J. W. Williams was the bassist and singer in the Chi-Town Hustlers when we played and toured. If you check my post about the Chi-Town Hustlers you'll find a link to some live recordings we made back then. 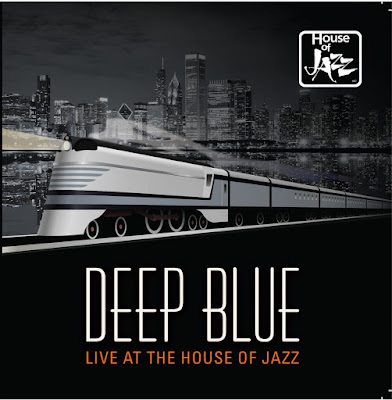 On Monday the 18th Deep Blue did the Monday Night session at the House of Jazz. The evening began with a trio set that featured myself, Naveen on piano, and Gary McKenzie on bass. The second set brought up my friend Steve to play drums. Steve had come down and sat in once with the band with Snooky so he was new to the group. Steve brought his friend "Hawk" We did a real Chicago blues set with some Muddy Waters tunes. We called Hawk to the stage to sing and play some harp. He did Sonny Boy Williamson's "Help Me" and B.B. King's "The Thrill is Gone" The band ended the set with "Sweet Home Chicago". Personally I loved this set because it took me back to Chicago and some of the great Blue Monday sessions. It had the real Chicago blues feel, it was loose but the groove and energy was really kickin' and most of all, everybody had a good time. It's sets like this that give people a reason to go to a club on Monday night. Steve joined us again for the third set and we mixed jazz and blues. Gary McKenzie played some smokin' bass on Duke Ellington's "Caravan". On January 22, I played with the trio at House of Jazz. It was one of those bitterly cold nights so the crowd was small but appreciative. As usual Sebastien Pellerin played great bass and did some tasty solos and Maude Locat layed down some great chords and showed a fine grasp of the bluesy jazz idiom. My pal Snooky Alston dropped by and sat in for a few tunes. The evening ended with the trio doing some pure jazz that were in the mood to play. Highlights were "Almost like being in Love" and a killer rendition of "Night and Day". Tonights the night. This is gonna be a fun night. Maude Locat on piano, Sebastien Pellerin on bass. We've got some great tunes lined up. A cold day but we'll warm up the house. We'll be on stage at 7:30. See you there.